From wherever you are in the World, we can join in on one accord as we lift ourselves in adoration to Yahweh! There is no void of distance in the Spirit Realm. We have been coming together from all parts of the globe to give ourselves as a first fruit offering unto God since 2005. This is a time of fasting and prayer for the first 7 days of the New Year. God has never failed to meet us and show Himself Mighty in our midst. If this is your first time joining us, you can join in from wherever you are. This is all about giving God your focus during a time of prayer and fasting for the first week of the year. As the saying goes, how you begin a thing will determine how you end it. Your fast is between you and God, whether you do a Daniel fast, full fast, Juice fast or partial fast during a certain time of the day is completely up to you. Remember, we are not fasting to get something from God; we are fasting to give of ourselves to God. We want to pour ourselves out as an offering unto the Most High. We want to empty ourselves of any and everything that would hinder the flow of God in our lives. Our Focus this year is to become Worship! We seek to transcend from worship being what we do, to its becoming who we are. Every day at 12noon EST I will conduct prayer on BlogTalkRadio and lift up your needs and those of others. I encourage you to join me for there is power in agreement. 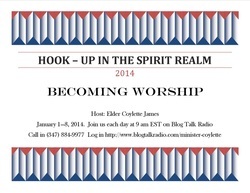 Join in at http://www.blogtalkradio.com/minister-coylette, or you can call in live at (347) 884-9977. Remember, if you miss the live broadcast each day, they will be archived so you can log on and listen to them later. Please send any prayer request you have to me by December 27 so I can include them in our prayer calendar. Send them to coylette@coylettejames.org. If you are in the Las Vegas area, you are welcome to join us at New Bethany Family Worship Center For All Nations, 1229 West Owens Ave. Las Vegas, NV 89106 where we will be shutting in for the 7 days. PLEASE NOTE IT IS NOT NECESSARY FOR YOU TO COME TO THE SHUT-IN TO PARTICIPATE. Every year I get people who tell me they can’t be a part of this because they are not in Las Vegas. :-) This is merely an announcement that if you would like to come in for prayer or to just sit before God you are welcome to do so. The Shut in will begin at 12 midnight January 1 and close out at 8AM January 8. God Bless you, I hope to meet you in the Spirit Realm!